We have just enjoyed a wonderful season, both concerts taking place in Southwell Minster. Haydn’s Creation and Verdi’s Requiem went really well and we enjoyed singing with Mansfield. The ‘Summer Singing’ was a different experience as we performed in the Byron Festival concert with Newstead Abbey Singers, Newstead Brass, the choir of St. Mary’s Newark and Juvenes Cantores Sarzana, a youth choir from Sarzana Cathedral, Italy. Bingham sang works by Charles Paterson, R L de Pearsall and Eric Thiman and the concert ended with the first public performance of Guy Turner’s ‘Byron in Italy’ which I thought was excellent. Some of the tunes are still buzzing round my head. This season we look forward to ‘War, Remembrance and Peace’ on 17 November 2018 at St. Mary’s, Radcliffe. Emily Hodkinson the winner of the ‘Bingham Bursary’ in January will be one of the soloists. Works by Haydn, Brahms, Ivor Gurney and Thomas Turner. Christmas concert in St Mary’s Bingham and then back to Radcliffe in May singing works by Elgar, Thiman and Guy Turner with solos by Caroline Clemmow (piano) and Harriet Astbury (Soprano). The summer singing programme is not yet decided, but there will be a lunchtime performance in Newark. Once again, I would like to mention how important it is for us to attract new members, and to make newcomers welcome and comfortable. We all need to make space for new members to sit next to us and to feel they are a part of the choir as quickly as they can. Lastly, if anyone has ideas about how we can improve the Bingham experience, please let committee members know. I look forward to seeing you on 5th September. (Full details of the coming season’s programme are provided later in this Newsletter). About 50 people attended – there were 32 apologies. The Minutes of last year’s AGM were accepted without amendment. There were no Matters Arising. Huw Cadwallader said that the Society’s current assets were just under £33,000, an increase of £1,700 on last year. Gift Aid will provide about another £1000. The Duruflé Requiem in May 2017 made a small loss; the Creation in November was expensive, but costs were shared with Mansfield. Huw thanked Sheila Barwick for her generous donation of £2,000 from the sale of CDs and her husband’s hi-fi. The Marcus Farnsworth Singing Day also provided substantial income. Thanks to all those who helped to contribute funds in many different ways – John Bannister’s Half-Marathon, David Atkins organising the 100 Club and Jeff Crampton the tea and coffee. John Beaumont donated his usual £500, plus a further £500 for our new venture, the Bursary and Prize competition which, with a large audience, made only a small loss. We have purchased new music folders, a stock of “Carols for Choirs” and some wine glasses. We continue to invest in our website’s development. Next year’s finances will include the Verdi Requiem concert, which will be expensive, but shared again with Mansfield. Our next concert, in recognition of the Armistice, will also be costly, but expenses for the Byron concert in July will mostly be met by the Byron Society. We should make only a small loss next year. We have opened a new online bank account with Lloyds Bank. Two signatories will be required for cheques, and there is a checking system for online transactions. Huw thanked Pam Brooks and Hugh Holbrook for examining the accounts. He is now standing down as Treasurer. 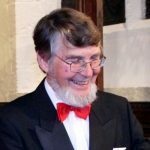 John Bannister thanked all those involved in setting up and preparing for the two concerts shared with Mansfield this year, as well as members of the Committee involved in fund-raising and other events. Sheila Barwick was thanked for her generous donation, Richard Joyner for bringing about the Bursary and Prize Competition for young musicians, and John and Barbara Beaumont for providing the winner’s prize. We hope to be able to run the competition again in 2020. John thanked Guy for preparing us to a high performance standard and also for running the Quiz Night. He thanked Ed for his contribution as accompanist and coach. He also thanked those who set up and clear the rehearsal room each week at Carnarvon School; Pam Brooks and Hugh Holbrook for again examining the accounts; and Robin Aldworth for his help with photography and poster design. Despite the good work of our voice-part mentors, our new members can often feel a little isolated, so we need to be inclusive. 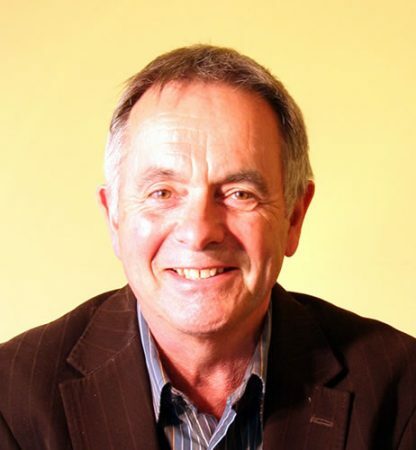 Huw Cadwallader has been a diligent Treasurer for many years, and was thanked now that he is standing down. John himself will serve one further year as Chair. Jeff Crampton has been with the choir for over 30 years and is a life member. He has been Chair and committee member, has set up furniture and coffee for rehearsals and conveyed staging for concerts, using his own transport, as well as making various enabling devices. He is now leaving the choir, but will always be welcome. The meeting agreed that membership subscriptions should remain at £95. It was also agreed that Summer Singing should be part of the choir’s year and that the subscription should include this for the foreseeable future, with annual review. That the Society should match the Beaumonts’ donation, making the Bursary worth £1,000 to the winner. 2nd and 3rd prizes would be awarded if the quality was good enough. Other applicants will be given £50 towards expenses. Pam Brooks and Hugh Holbrook have again agreed to act as examiners and were re-appointed. Guy Turner said the year had been a satisfying one. In summer 2017, members of the choir had sung in a lunchtime concert at Newark, which he hoped could be repeated in future. Both the Creation, and the Verdi Requiem in particular, had been truly memorable concerts: the choir had done all he wanted and sounded as good as most auditioned choirs. The Christmas concert was as always a crowded and fun community occasion, with an excellent contribution from the Carnarvon children. Thanks to Richard Joyner for the Bursary concert: this was very successful, with Emily Hodkinson the standout winner – she will be singing in our November concert. The Byron concert in July is for the 200th anniversary of Byron living in Italy. We will be joined by an Italian choir from the region where he lived, by the Newstead Singers and the Choir of St Mary’s, Newark, and also a brass band. In November, we will mark the Armistice with our concert “War, Remembrance and Peace”, with a small orchestra and soloists. The music, by Haydn, Brahms, Ivor Gurney and Guy Turner will reflect the themes of the title. In May, Caroline Clemmow will accompany us in a programme of English music by Thiman, Elgar, Guy Turner and Rutter. In 2019-20 our November concert will include pieces by Handel, Vivaldi and Purcell, and in May 2020 the Brahms Requiem with Mansfield. Guy thanked the committee for their hard work and support. The following were elected unopposed: Chair John Bannister; Vice-Chair Sally Ashton; Secretary Valerie Morgan; Treasurer Brad Poulson; Programme Chair Peter Iley; Librarian Margot Anderson; Membership Secretary Janet Chapman; Publicity Officer and Website Judy Unell: Fundraising Chair Vacant; Box Office Tim Connery; Ordinary Members Beryl Cottrill, Tina Warrington, Janet Iley and Juliet Ward. It was agreed that from September, people would bring their own cups for coffee, to cut down on the use of polystyrene cups. (See note later). Brad Poulson gave a short presentation on the new GDPR legislation, which will involve some changes to our application forms and communication with members. Concerns were raised about the storage of the conductor’s dais (the school is unwilling to do this), and older members moving staging about. A presentation was made to Jeff Crampton on his departure as a member, in recognition of all he has done for the choir. Minutes of previous AGMs and Committee Meetings are available on the BDCS website. The minutes of this AGM will not be available until they have been approved at the next AGM. Lord Byron was once described as ‘Mad, bad and dangerous to know’. This was certainly not the verdict of the packed church of St Mary Magdalen Newark on Saturday the 7th July 2018. 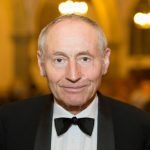 Indeed, Byron’s life, his poetry and his many connections with Nottinghamshire and Italy were celebrated in grand style by the 150 musicians and audience in St Mary’s while elsewhere many were rejoicing at England’s football prowess. 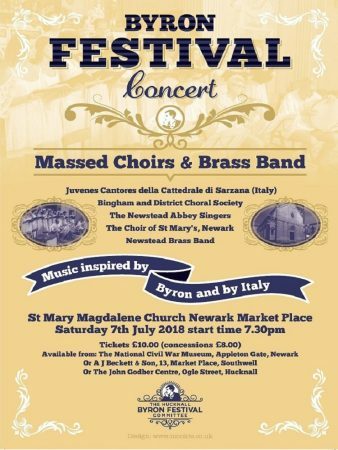 This Concert, organised as part of the Hucknall Byron Festival, replete with music inspired by Byron and by Italy, was performed by four choirs and the Newstead Brass Band. Topping and tailing each half of the evening the Newstead Brass Band, under the baton of Jim Davies, performed a wide range of pieces, notably with the Italian theme in mind, the Overture to ‘The Marriage of Figaro’ and Respighi’s ‘Pines of Rome’ . A real highlight of their stirring and varied repertoire was Principal Cornetist Sarah Simpson’s beautiful solo in Caravelli’s ‘Let me try again’. The first choral fare of the evening was provided by Juvenes Cantores from the Cathedral of St Mary in Sarzana, Southwell’s twin town in Italy, close to San Terenzo where Byron lived for a while 200 years ago. These talented young singers showed their dedication by coming straight from the airport a few days before to rehearse with the other choirs. On the night, conducted by Alessandra Montali, their performance of pieces by Palestrina and Carissimi delighted the packed audience, especially the wonderful solos sung by Eloisa Iori. Bingham and District Choral Society, having only recently performed Verdi’s ‘Requiem’ at Southwell Minster then sang the first Byronic words of the evening, notably ‘She Walks in Beauty’ and a setting of ‘Mutability’ by Byron’s good friend Shelley which was composed specially for the evening by Charles Paterson. In the second half of the evening continuing the local Byronic theme, the Newstead Abbey Singers under Nicholas Thorpe gave another rendering of ‘She Walks in Beauty’ by Tony Glover followed by three entertaining part songs from Byron at Newstead composed by Alan Buller – the last of which ‘Fill the Goblet’ teased all present on a very hot and dry July evening! After a brief foray into the world of Rogers and Hammerstein by the Newstead Brass, it was the turn of St Mary’s own choir, including the youngest singers of the evening and directed by Stephen Bullamore who gave splendid renditions of poems by Shelley and Thomas Moore. The climax of the evening, involving all 150 musicians, was the premiere of a work entitled ‘Byron in Italy’, commissioned by the Hucknall Byron Society for the Festival Concert. 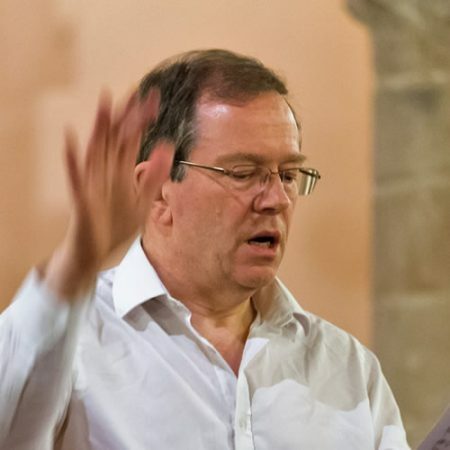 This was not only composed but also conducted by Guy Turner, lay clerk at Southwell Minster and Conductor of the Bingham and District Choral Society. This powerful work in five quite contrasting movements ranging from the frenetic ‘Cascata del Marmore’ through the lyrical ‘But Once I Dared to Lift my Eyes’ to the dramatic evocation of the buildings of Ancient Rome in ‘On the Palatine’ , proved a fitting celebration of the life and work of Lord Byron. Newark, where the poet’s first works were published, Southwell, where Byron lived for a time, Newstead Abbey, the family seat, Hucknall where he is buried and Sarzana with its long connection with his later life can be truly said to have celebrated this 200th anniversary with great style. 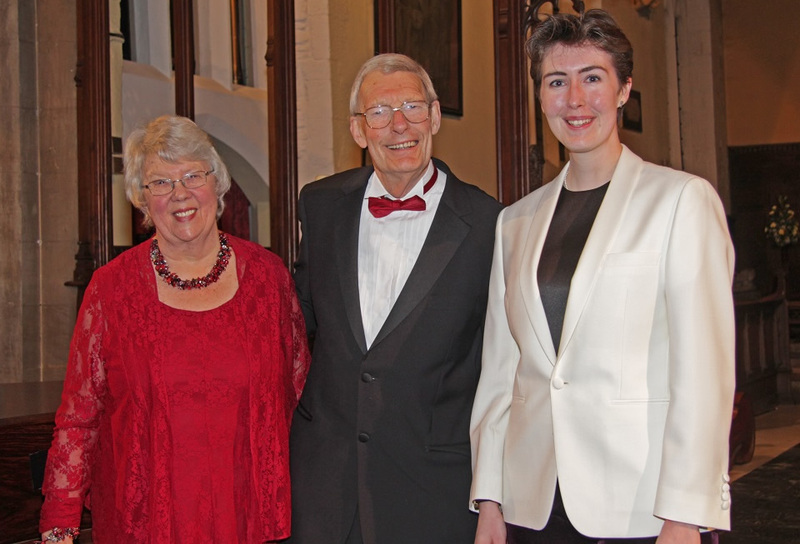 On a cool Saturday evening in January in St. Mary’s Church, Bingham, Emily Hodkinson became the first winner of the John and Barbara Beaumont Bursary and the BDCS prize for aspiring professional musicians aged under 24. Emily is a mezzo-soprano from Nottingham and she sang music by Gounod, Brahms, Purcell and Hahn. She was accompanied by Angela Foan. The bursary of £500 was contributed by the Choir’s Patron and his wife, and Emily will use it to further her musical career. The BDCS prize was the opportunity to sing at one of our future events and it has now been arranged that Emily will take part in our concert on 17 November 2018, “War, Remembrance and Peace”. She will sing three songs by the Gloucestershire poet and composer Ivor Gurney (1890 – 1937). Gurney survived the First World War’s trenches but suffered severe mental illness for the rest of his life. Ben Watkins, a bass-baritone also from Nottingham, took the second prize of £200, his programme comprising music by Caccini, Howells and Butterworth. The third prize of £100 went to Katharine Ley, a cellist from Lincolnshire. Also shortlisted were Lydia Ward, Olivia Slatter and Eleanor Rashid. The judges were Angela Kay MBE, Barbara Cobb, Guy Turner and Ed Turner. There was a real buzz of excitement throughout the evening and it was generally agreed that the standard of the competitors spoke well for the future of music in the East Midlands. The Committee has agreed that the bursary and prize will be offered for competition next in the session 2019 – 2020. John Beaumont has again offered £500 toward the Bursary, and our AGM agreed to add a matching sum. So the First Prize Bursary will be worth £1000. The competition next time will be limited to singers and will be opened for entry about this time next year. So if you know of any good young classical voices, do tell them about it. As always, full details and information on how to apply will appear on the website at the appropriate time. The re-modelled BDCS website has been key to promoting the choir over the past year and it is also proving a useful resource for existing members. Video clips of performances and interviews wth choir members provide visitors to the website with a friendly introduction to the choir. Pop-up notices on the first page instantly highlight forthcoming concerts, and further information is readily accessible on other pages. Linked to the website is our Twitter account. Twitter activity has continued to increase this year. We now have 101 followers (56 last year) enabling us to reach a growing number of organisations and individuals with quick information updates and reminders about concerts. If re-tweeted by the recipients, a single message can be disseminated very widely. For example, Making Music has sent out tweets advertising our concerts to its entire national network. I was very pleased with the Byron Concert which was the culmination of this year’s Summer Sing. BDCS performed its own three pieces extremely well, and the massed choir performance of Byron in Italy was a great success (and very loud!). The audience enjoyed it – though some correctly suggested the words should have been on the programme (my fault). I am conscious that this was quite a difficult piece to learn in the time and that this made the Summer Sing a slightly less relaxed few weeks than I had intended. Thank you for all the hard work that went into it – and for bearing with us when we had to change the rehearsal timings. There is some more of my music coming up but I promise it is much easier! I am looking forward to the exciting new season. The ‘War, Remembrance and Peace’ concert is a pleasing programme, balancing Haydn’s Nelson Mass (arguably his best mass) with shorter pieces by Brahms, Gurney and me. The programme is constructed to take us through music representing war (the Mass), remembrance (part of the Brahms Requiem and then the Gurney -Gurney, and the three poets who wrote the words, all fought in WW1), and peace – my Lux Aeterna (originally written for performance in Messines church in the Belgian battlefields). Emily Hodkinson, our bursary winner, will take a prominent role in this concert. Then in May we will be singing music by Rutter, Elgar and me again, plus the world premiere of a recently discovered piece by Eric Thiman. 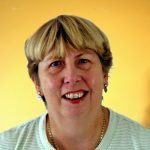 We will be joined by pianist Caroline Clemmow (who has appeared with the choir before, with her late husband Tony Goldstone). The plan for next year’s summer sing is subject to confirmation, but will hopefully be another lunchtime concert at St Mary Newark, this time performing music with piano – probably mainly folksong arrangements. Wednesday 5 September 2018 – 7.00pm for 7.15pm (See “Important Message” below). Enrolment evening and start of rehearsals for the Winter Concert. 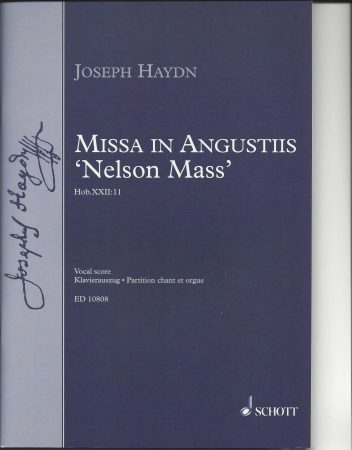 Autumn Concert: Haydn – Nelson Mass. Brahms – Requiem – 1st Part of 2nd Movement; Gurney – The Trumpet; Gurney – 2 songs (sung by Emily Hodkinson – Bursary Prize Winner); Guy Turner – Lux Aeterna). Concert at 7.30pm at St Mary’s Radcliffe on Trent Rehearsal at 1.30pm for 2.00pm. Christmas Concert: With Carnarvon Children’s Choir, Bingham Brass. Bingham Parish Church at 7.30pm. Rehearsal at 2.00pm for 2.15pm. Start of new term and rehearsals for the Spring Concert . Annual General Meeting, Carnarvon School. 7:30pm. Christmas Concert: Bingham Parish Church. 10% discount from Windblowers on production of membership card, and from Choraline. (Code available on request). John Fletcher website: The site holds rehearsal files allowing users to listen to their individual part, with the accompaniment in the background, either on its own or along with the other parts. The music can be listened to online or downloaded as an mp3 file which allows the user to vary playback speed and slow down fast, intricate parts. Most of the music we will be performing in the next 12 months can be found on the site. For access to the site the Society pays an annual subscription based on the number of registered users (40). Spare places are available. If you are not registered to use the site but would now like to be, please contact Bob Middleton either at a rehearsal or by email at bob@mid33.plus.com. He will then register your email address and you will receive an email from the site allowing you to set up direct access using your email address and a password of your own choosing. If you are registered but are having trouble logging on or encountering any other problems using the site, please let Bob Middleton know. www.choralia.net is a website where you can hear synthesised voices singing individual voice parts (it is very easy to download the necessary bit of free software). You can choose which voice part you would like to be highlighted. Choraline produces CDs for the individual voice parts – 10% discount – Code available on request. As you know, every year the Choir undertakes a series of fundraising activities. These have been both consistently successful and enjoyable. They are also important. Without fundraising we would either have to raise the individual subscription to £130 a year, or cut back substantially on our concert activities. Please therefore continue to support ventures like the 100 Club. Also, if you have an idea for a fundraising activity (preferably legal) that you would be willing to organise, please contact any committee member, or email choir@binghamchoral.org.uk. Before the start of term complete the Membership Application Form (attached to this mailing)and send it to Janet Chapman either by email or post with payment (cheque/cash or electronically). Please ensure you also fill in the sections about Gift Aid and the activity with which you can help the Choir during the term. Your Membership Card will thus be available for collection on 5 September and you will then be able to go straight to the table (soprano, alto, or tenor/bass) where you will collect your music. Fill in the application form and prepare a cheque/cash. Queue to enrol and obtain a new Membership Card. Go to the relevant table for your Music. You will need a Membership Card before your music can be issued. Mentors for each voice part will be on hand to help and advise you. New members will initially be welcomed by the Voice Mentors. You are very welcome to try us out for three weeks before committing yourself to membership. Your Committee believes that no-one should be prevented from singing with us by reasons of financial hardship and our constitution allows us to help anyone who finds themselves with financial constraints. 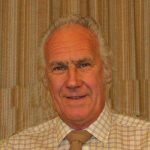 If you believe that you will have difficulties paying your subscription in full, please approach either the Chairman, John Bannister (Tel. 0115-914-0398) or the Treasurer, Brad Poulson (Tel 07734 056618). Your application will be treated in complete confidence. It was agreed at the AGM that rather than using diid=”review” class=”jump”sposable cups in the coffee-break, people should be asked to bring their own cups (although spares will be available for those who forget). 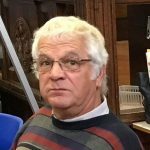 Sadly, Jeff Crampton will no longer be available to do the setting up for rehearsals – offers of help with this task will be gratefully received.